SPEAR Teams Up with Crutches 4 Kids For Second Crutch Drive! At SPEAR, our mission is to ultimately empower our patients and to restore their mobility and independence, to help them achieve their goals and give them back the life they want to live. The Crutches 4 Kids organization shares this mission, and as a physical therapist, I feel it is so important for us to promote mobility and support groups that do the same. In this country, we have a surplus of crutches that are readily available, and once an individual heals, the crutches mostly go unused in closets or are thrown away. However, in other parts of the world, crutches are rare and not readily accessible to those in need. At SPEAR, we hope to make a difference by collecting as many crutches as we can to help get children back to walking, going to school, and playing with friends. We first became involved in Crutches 4 Kids during their drive last fall, where SPEAR was able to collect over 70 pairs of crutches to be delivered to children in under serviced areas. 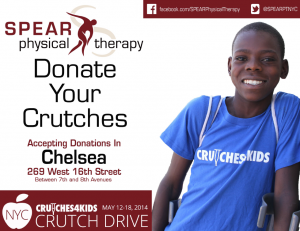 I am excited that SPEAR has a second opportunity to join Crutches 4 Kids as a part of their NYC annual crutch drive that will take place during the week of May 12-18. Please help us make a difference in these children’s lives by donating your crutches to our 16th Street location, 269 West 16th Street, between 7th and 8th Avenues, or any of the other designated drop-off areas around the city that can be found at http://www.crutches4kids.org/nyc-crutch-drive.